StarWars.com the official site just released an excerpt from the eighth book in the Fate of The Jedi book series entitled Ascension by one of Roqoo Depot’s fave authors, Christie Golden. Click the link to read an entire chapter! As Luke and Ben Skywalker pursue the mysterious and powerful Abeloth, the Lost Tribe of the Sith is about to be sundered by an even greater power. On Coruscant, the government strains to the brink of collapse in the struggles resulting from a power vacuum. These tensions tug the Jedi Order in conflicting directions — and the epic Fate of the Jedi novel series continues! The book is due out in hardcover form this August. 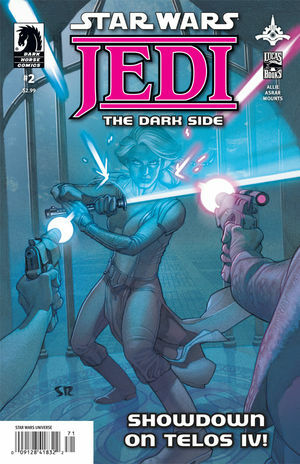 Jedi – The Dark Side #2 hits stores today. Latest Databurst From the 501st covering event news from June 22-28th. Be sure to mark your calendars and show your support. Ohio Garrison will be in Bethel, OH for Sub Scout Day Camp. Southern California Garrison will be in Huntington Beach, CA for the Sci-Fi Sanuk Shoes Event. 70th Explorers Garrison will be in Cape Girardeau, MO for Cape Comic Con. Garrison Carida will be in Jefferson Country, WV for the Relay for Life. Midwest Garrison will be in Schaumburg, IL for the Legoland Discovery Center event. Old Line Garrison will be in Ellicott City, MD for the St. Charles Ruins Community Event. Central Garrison will be in Shenandoah, IA for the Relay for Life and in Omaha, NE for the Star Wars Party at the Willa Cather Library, open to the public. Garrison Carida will be in Wilmington, DE for an Armor Party and in Cranberry Township, PA for Alex’s Lemonade Stand Event. New England Garrison will be in Harrison, ME for the Summer Reading Kickoff at Harrson Village Library and in Salem, NH for the American Cancer Society Relay for Life. NorthEast Remnant Garrison will be in Caldwell, NJ for the Caldwell Public Library event. Old Line Garrison will be in Bowie, MD for the Bowie Baysox Game Star Wars Saturday. Southern California Garrison will be in Chula Vista, CA for an Armor Party. Capital City Garrison will be in Toronto, Ontario for the 7th Annual Toronto Walk Now for Autism Speaks. Garrison Carida will be in Zieglersville, PA for Alex’s Lemonade Stand Event, “Be there or we will put you in carbon freeze,” and in Altoona, PA for the Altoona Charity Toy Drive Open House at Sacred Keystone Ink. Old Line Garrison will be in Bel Air, MD for the Baltimore Blue Claws Fundraiser. Great Lakes Garrison will be in Lexington, MI for MDA Summer Camp. Star Wars authors Timothy Zahn, Aaron Allston, and Michael A. Stackpole will be at the Origins Game Fair in Columbus, OH from June 22-26th. This year’s Origins Game Fair will have a Victoriana costume theme including everything from classic Victorian to steampunk. The event covers board games, RPGs, and LARPs (live action role play) including a zombie apocalypse area. The key guests this year are Timothy Zahn, artist Ed Beard Jr., and theme guest of honor Shane Hensley. Speakers include Michael A. Stackpole, Aaron Allston, and others. For more information you can check out the Origins Game Fair official site.